Magical spells and fantastic creatures might sound fun and interesting, but they are nowhere close to being enough to save “Fantastic Beasts: The Crimes of Grindelwald” from being a dull two hours of someone’s life. After escaping from prison, evil wizard Grindelwald (Johnny Depp), hides out in Paris as he builds up his army of followers. At the same time, the protagonist from the first “Fantastic Beasts” movie, Newt Scamander (Eddie Redmayne), also ends up in London as he tries to reunite with his love interest Tina Goldstein (Katherine Waterson). If that plot description sounds extremely coincidental for the sake of plot convenience and getting all of the characters where they need to go, that is because it is. So many story and character arcs in this movie are set up by mere coincidence or through overly convoluted circumstances. This could have been avoided had the number of characters the movie was trying to juggle was cut down, but it was apparently important that the movie had every single character from the previous film return alongside a whole new group of characters. As such, character arcs feel spaced out and underdeveloped, and the characters end up being blank slates. In terms of character arcs being spaced out, the best example of this is the returning character of Queenie (Allison Studol), who essentially has a five-minute scene, disappears from the movie, has another five-minute scene and disappears from the movie again. Rinse and repeat. In terms of blank slates, the two leads of Newt and Tina are essentially flawless and any character drama that either one might have with each other or anyone else makes little sense or exists for a dumb and contrived reason. Only two characters, Dumbledore (Jude Law) and Seraphina (Carmen Ejogo), have any sort of interesting backstory. The problem with that is Dumbledore is not that important of a character in this story and Seraphina’s backstory comes out of nowhere and is wasted on a character that the audience had little reason to care about beforehand. With all of these character stories happening simultaneously, the movie feels disjointed and the progression feels off. An example of this is towards the end, where two characters explain their roles and motivation in the movie back to back. The second story negates aspects of the first story, so the first story should have come earlier in the movie so that the audience’s understanding of what was happening could be flipped. Instead, by being told back to back, the stories lose all impact and just serve as two bits of uninteresting exposition. Not only does the movie feel disjointed, but it can be utterly confusing at times. 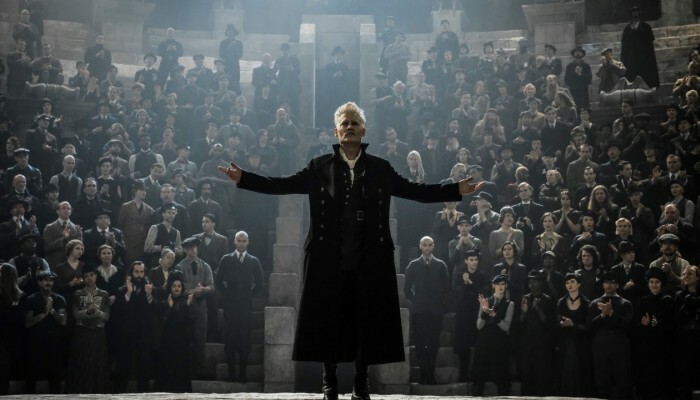 Since the characters either know about Grindelwald and his scheme or seemingly do not care about it until the plot calls for every storyline to meet up, certain things go unexplained for large portions of the movie because the characters do not need to discuss it to inform others of what is happening. Due to that, important pieces of information that should have been revealed earlier get revealed at later points of the film, resulting in previous scenes and stakes being difficult to comprehend. How does a disjointed, confusing and contrived movie like this end? In a disjointed, confusing and contrived way of course. The climax of the movie is an embodiment of every flaw the movie has. It is disjointed in that so much happens and barely any of it has any weight to it, and confusing in that characters’ locations are lost and it can become unclear what happened to them at certain points. It is contrived as things happen for the sake of the plot, not because they make sense. One thing that the movie excels in are the visuals. The effects of the creatures look good and their designs are interesting and fun. Alongside this, the cinematography and some of the visuals are surprisingly beautiful. With very little to look to in terms of the characters and a story that is poorly explained and overflowing with subplots, “Fantastic Beasts: The Crimes of Grindelwald” is a dull experience, and a poorly constructed one at that.